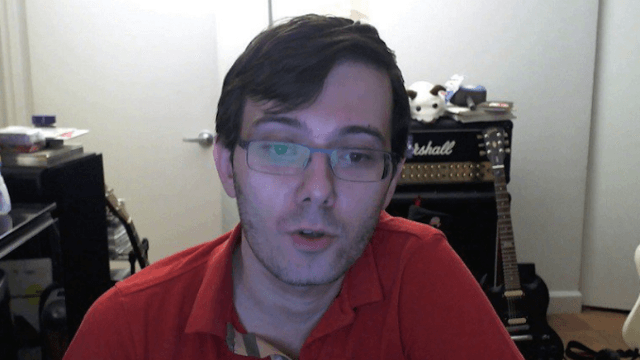 Cool guy Martin Shkreli suspended from Twitter (again) for harassing female journalist. Normal-sized, not-at-all-annoying, and always-relevant human being Martin Shkreli is no stranger to Twitter suspensions—he's been temporarily kicked off the platform before. Heck, he can't even take his internet friends out to a happy hour without the bar preemptively banning him. Still, getting the boot from Twitter again for targeting a writer whose editorials and reportage have gone viral of late is a notable milestone. Shkreli had been openly harassing journalist Lauren Duca, whose Teen Vogue editorial "Donald Trump Is Gaslighting America" and subsequent tussling with Tucker Carlson in an overtly sexist interview both captured the internet's attention. It would take days to diagnose everything wrong with Shkreli, but "not being the center of the internet's attention" is definitely a triggering circumstance for him, so he DM'd Duca to ask if she'd accompany him to Trump's inauguration. She declined. Shkreli escalated by changing his bio to note his "crush" on Duca, replacing his header image with photos of Duca, and Photoshopping himself into a picture of Duca and her husband to use as his avatar. Like, that's a picture of me and my husband. I feel sick. After Duca and others tagged Twitter support and CEO Jack Dorsey to point out this invasive, harassing behavior—and in the midst of Shkreli apparently continuing to tweet at Duca—his account went down. It remains to be seen whether this suspension will be permanent. I see Martin Shkreli is trending. Let me guess, Trump is nominating him for Secretary of Health & Human Services. Shkreli, who allegedly looted his own pharmaceutical company for millions to pay back investors in a previous hedge fund scam and has been indicted on securities fraud, will presumably have to resort to Facebook Live to speak to his committed fan base of smart, handsome, nice young men, at least for the time being. But watch out: you never know when he might turn up on Snapchat.